Cloud computing offers many benefits to organizations of all sizes, but it is dramatically more beneficial to smaller companies. This is why it is truly necessary to adopt cloud into your new and small business, in order to increase your chances on the medium and long term. The other reason for which the adoption of cloud computing is important for a small company is that the main obstacles and objections usually faced by larger business are of less importance to the smaller and newer business. In any way you want to view it, cloud computing looks like a match made in heaven for small business and start-up companies. It’s the very best way to remain relevant on the changing market, to gain the enterprise class you want or simply to access the customer class functions without the effort of developing this class on your own or spending a big sum of money to purchase it. There is no denying the importance that cloud computing plays in business, whether it is platforms or the availability of applications over the internet and so on. Whichever the exact form, cloud computing has clearly given medium and small businesses an unmatched technology access sophistication. The benefits that abound in information technology have been great and its reasonable impacts are getting even better and more pronounced as the years go by. Cloud computing does not only increase the efficiency of businesses, but it also as a measurable and visible influence on the much needed changes within the models of business in their entirety. The problems have always been the financial, skill and effort aspects of adopting cloud computing, especially for small and medium businesses. This constraint has made the advancement of small business into the enterprise/customer class quite limited. Only the larger companies, which have the sufficient funds to purchase the required application sophistication, support the operational cost and to carter for a reliable deployment, have benefitted from the true potential of information technology. All the problems that are faced by small businesses have been taken care of by cloud computing. The cloud offers easy access to all the benefits of technology without having to worry about the usual problems, such as deploying, building, investing, maintaining and operating the infrastructures involved. Pushing the business to have a better focus on what technology can do for them rather than focusing on how to deliver technology is the main shift we can already see happening. This is good news to small business owners because the gap between the large companies and them has been breached and almost closed, through the help of the cloud. To address the reasons why it is paramount for small business owners to adopt cloud computing in their organizations, we are going to itemize ten reasons for which it is mandatory for small business to adopt this new technology. 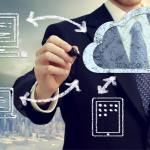 Every day, technology witnesses further advancement, and much of it happens in the cloud. With this trend in mind, large companies that are into technology have taken cloud as their main focus, while the companies that offer technology services have also integrated everything they offer into the cloud. Various innovative start-ups, which are just enabling and releasing their new applications and new use cases, are establishing them directly in the cloud. In any way or form it is, be it new ways of customer connection, or collaborating with and within an organization more efficiently, most of these tools are cloud based only. Any business – be it big, medium or small – can afford neglecting the consideration of these technologies that cloud computing brings. The management of IT could be very demanding to say the least. Even in small businesses, the need to manage the IT department is as demanding as it is in larger firms, as the complexity and the number of users and applications increases. A relatively large and diverse set of professionals, in any capacity, be it full-time employees or outsourced professionals, will be needed to meet up with this growing IT demand. This form of employment can be fulfilled through support personnel, administrators, hardware technicians, network administrators, database experts, application developers, web architects and technology managers. Meeting this demand can become near impossible for small businesses, but the cloud offers a valid way out, especially for small firms, because the technology skills needed for the integration of cloud has changed for the better. Cloud computing enables a business to plan and focus on the purpose and aim of its IT, leaving much of the maintenance, support and operational cost aspect of the job to the cloud service provider. If there is one business-oriented advantage that cloud computing has definitely brought, it is scalability. This is the fundamental promise that cloud brings to the fore. Various computing resources have been shared among a wide variety of users, which thus enables scalability, increasing the computing capacity in the aspect of storage, number of users and the general computing power features that are on demand. From the perspective of business owners, this development has now made the environment of IT readily available with minimal costs, and has also made it fluid and dynamic. This enables new and small businesses to come up with new services, while also increasing the level of customer interactions, because there is now enough flexibility in the value of usage based pricing. Cloud computing services have been integrating common standards in their every aspect, like in the areas of application interface, data representation or within the processes of authentication and identification. This outcome has given a huge possibility to small businesses, because they can now have the leverage of complex technologies to select from, in order to pick the one which best suits their needs and have the complete enjoyment of the higher level integration. People tend to say that it is fairly easy to enable an integrated experience if a cloud computing application has a single family or platform, but on the contrary, the growing number of integrating services and the options available that may be used opens the cloud to an unimaginable complexity, and the opportunities that come with it. Just like the big companies need an all-round daily access to their applications, so it is in the case of small businesses: they also need the 24/7 access to the business data and applications no matter the device or their location. There is an increase in the use of mobile devices (i.e. tablets and phones) for business applications, whenever on the move or in the place of work. Because cloud storage solutions are now available everywhere and all the time, the democratization and consumption of access to the internet have been pushing providers of cloud computing to be even more accessible and readily available whenever and wherever they are needed. This now makes cloud computing applications more likely to be available and compatible with various types of devices. Soon, we will probably witness even more cloud integration, even if we can’t at the moment imagine how more would be possible. The rise of cloud computing has given businesses the complete ease of assessing, exploring and of selecting various options. Cloud computing has allowed all companies and organizations the choice of what accounting, messaging, CRM, collaboration apps and so on to use, after the stage of proper assessment and exploring of all the possible options available. This ease of choice even comes at an affordable cost, especially when compared to the regular onsite technology we were restricted to so far. For the bigger companies, adopting cloud computing, most times, refers to a project of a complex Infrastructure as a Service (Iaas) solution, one that has to be integrated and installed into the already existing company systems. While for small business, quite on the contrary, computing in the cloud is more of a complete cloud based software as a Service (SaaS) applications and application suite; there is no need for advanced IT in this case of small business. One of the major drawbacks that have stalled the integration of cloud computing into business systems has been the issue of security. However, cloud based applications are much more secure than onsite applications, and this holds true mainly for small business organizations. There is no denying the fact that taking care of the security of a business infrastructure is difficult, because the infrastructures and applications involved have to be monitored regularly, patched and maintained, and this trend has endured in spite of a looming online threat. This needs huge expense and expertize, which a small business will not be interested to undertake. Additionally, there are other forms of security breaches that might occur, such as a potential cut in the availability of power, outages in networks, failures in hardware and common human errors. These security shortcomings are well addressed by a specialized cloud computing service provider, because they have already invested some significant time in the compliance to the standard of securities, infrastructure redundancies and the best operational practices. Cloud computing service providers promote their deals and offers in a certain way, by highlighting availability, reliability and performance. The features which are usually obtainable from the onsite IT infrastructure and the way this infrastructure is set up for many small businesses have become more and more complex. The required complexity of this onsite IT infrastructure has grown organically, and this has ended up making the whole process very difficult to manage with a clear performance expectation, as long as you stick to traditional onsite IT. Cloud service providers, instead, give explicit service level agreements regarding stats such as availability, migration, host failure, application performance and datacentre uptime. Also, the cloud support they offer is always available, 24 hours of the day, to assist users with any issues they may face. Small businesses are always looking for a way through which they can reduce cost. From this perspective, cloud computing is a great investment, since these services are basically charged based on what you use. Thereby the cost of overcapacity and idle resources are saved, also since cloud adopts mostly op-ex other than cap-ex, it is much friendlier to cash flow for small business. The firm will not bear the cost of computing resources that are not needed.